MAYBE, JUST MAYBE, I'VE MORE FULLY ACTUALIZED INTO BELLY AND BECOME EVEN MORE LIKE MYSELF WITH MY OWN PREFERENCES. Why am I yelling? I just want to show you pictures. I took some photos in both natural and artificial light. It makes a difference because the artificial light set up is handy for capturing color (and also allowing me to blog when I feel like it vs. when it's a crazy bright sunny day which coincides with my free time) but doesn't do a great job showing all the texture and the SUQQU famous complex shimmers. Oh well. I gotta let go something. See, I can compromise. 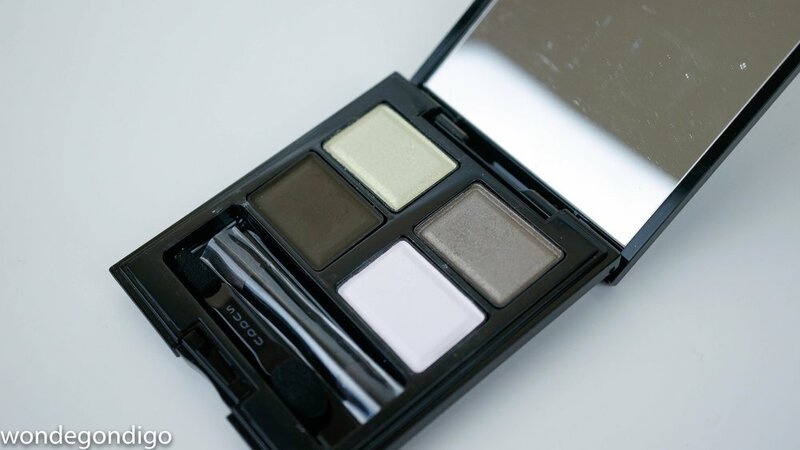 I keep referring to this quad as "the green one" from the old Blend Color Eye Shadow palette line up, which is currently UK exclusive and imminently facing being forever gone. It has a near frost seafoam green, that is chock full of pale chartreuse, warm gold and bright white shimmer. a warm green toned shimmery grey which is full of a bedazzling amount of various shimmer, but which applies in a very somber way. (shimmer which are some red, green, bright blue, etc). It comes to life when light hits it in a particular way. a dark olive green, looks like the dark green in an army camouflage print. It really does swatch patchy doesn't it? And poorly pigmented to top it off. 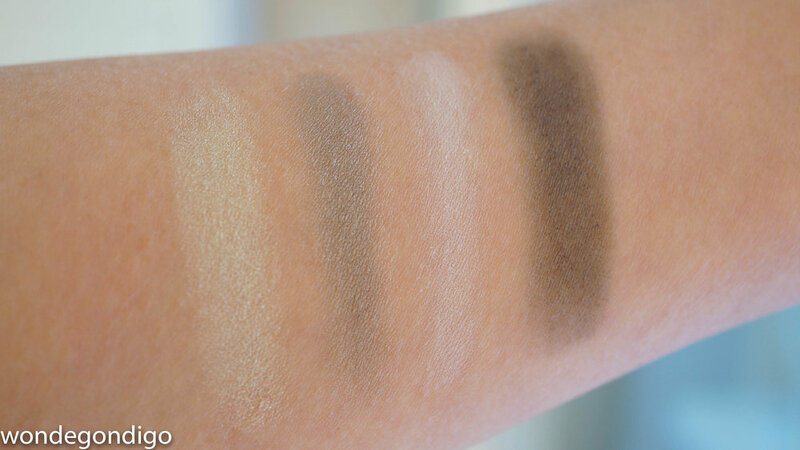 But it applies as easy as I can dream and blends perfectly with the other shades. Here's a swatch of the three shades (excludes the base white) which I've layered (dark green, the grey and then the light green). 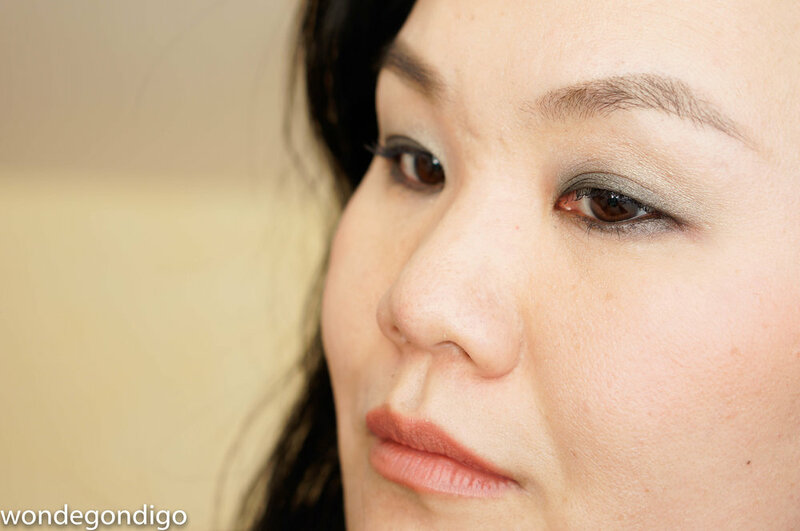 It creates a perfect gradation with none of the work of actual blending or hard work! How easy is that for a bozo like me to create something that looks like I actually blended something!? In natural indirect, natural direct and artificial lighting. In the look below, I'm wearing the same easy, fail-proof layered placement that I almost always use when I wear one of these old quads, in this tutorial with 08 Mizuaoi (here). If you have eyes for this oldie from SUQQU, the last of the gorgeous famous SUQQU greens I would urge you to make your move. Who knows when the last of the inventory is gone and if they will ever restock? At the time of writing this post, it is available on Selfridges website (here) (not affiliated link). Anyway, one more look at this special beauty. I actually find greens a little difficult to carry off confidently, but not overdoing the light green makes this quad very flattering. Do you like green eye shadows? Have you tried Kokedama?